How to keep track of Medicines! Is your child ill? 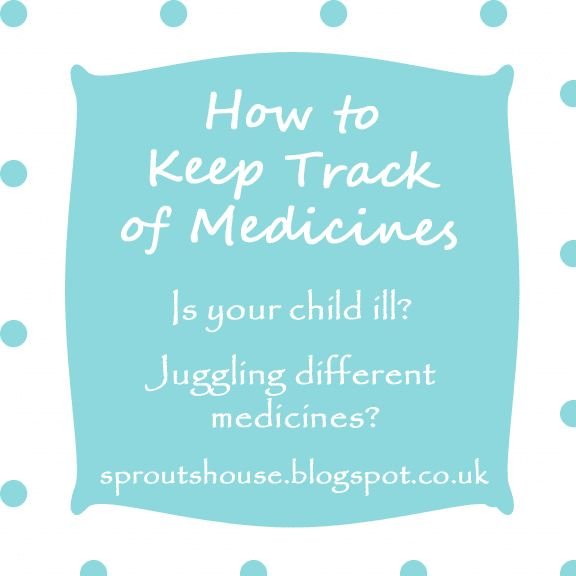 Are you juggling different medicines? 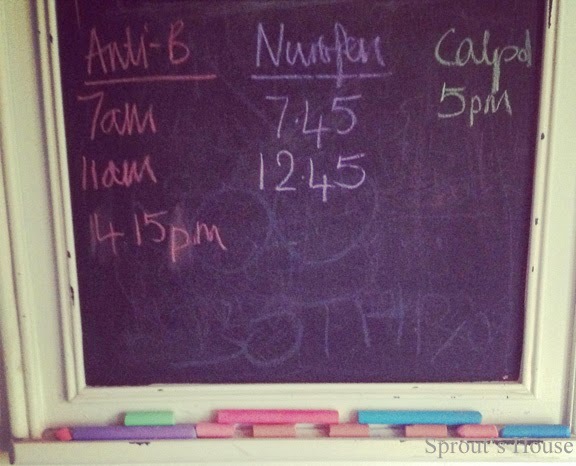 Trying to keep track of which child has had which medicine? Sprout’s House was hit by another wave of germs which nearly took us all down. Not content with having chicken pox at the start of March Sprout rounded the month off with a raging chest/ear infection. At the beginning of the week, I headed off to London on a course leaving a slightly lethargic Sprout lying on the sofa. She made it into pre-school on Monday morning before succumbing to a temperature by midday and having to be rescued by her Daddy. I arrived home on the Tuesday afternoon to find a rather subdued Sprout and a rather tired Daddy both of whom were suffering from a serious lack of sleep after two nights of coughing and spluttering. Another sleepless night followed, by which time Sprout wasn’t eating and barely drinking so off we went to the doctor who diagnosed a chest infection and possibly an ear infection too. We left having been prescribed a hefty dose of antibiotics alongside the Calpol and Nurofen that she was already taking. And this is the crux of the post….after a limited amount of sleep my ability to juggle three different types of medicine was pretty non –existent. I ended up keeping a record of what I had given her and when on the kitchen black board as well as using the back of an envelope to keep a note of how much water I had syringed into her mouth. Not particularly effective as I kept forgetting to update both! 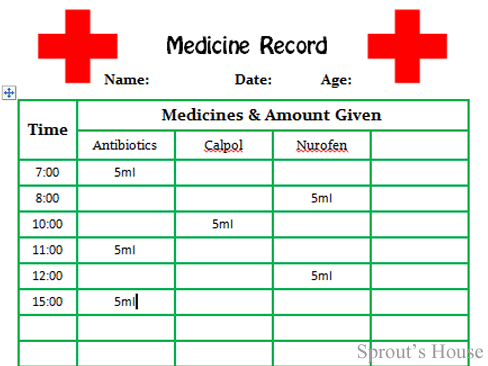 So with that in mind, I have devised a Medicine Record sheet to help me keep up with the medicines that I have given Sprout. The week ended with both Sprout’s Daddy and I fighting a losing battle against Sprout’s germs – although we are all on the mend now. It is certainly the most ill I have ever seen her and has beaten chicken pox hands down in terms of severity. Here’s hoping that the arrival of Spring, and fingers crossed some warmer weather, will give us all some renewed energy and vigour!! I hope you are all feeling well. If not, please feel free to download my Medicine Sheet to help you juggle all those medicines. Leave your survival tips in the comments below!! This is a great idea and something I needed last week and last year. Last week my son also had a chest and war infection so we were juggling and last year he always had much of the same thing. I'm hoping now he's had surgery to have his adenoids removed and grommets he will have fewer illnesses and there'll be less medicine juggling! Thanks for linking up! Such a good idea. I end up scrawling things on post-it notes, then misplacing the post-it notes in the mess that usually consumes my home when there is sickness. Thanks so much for sharing! I'll be using this. I found you on turn it up tuesdays....I'm a nurse, so you post intrigued me.. Such a good idea! I'm posting it on my google page for my kids to see. I also blog about my adventures in travel... Stop by and take a look!